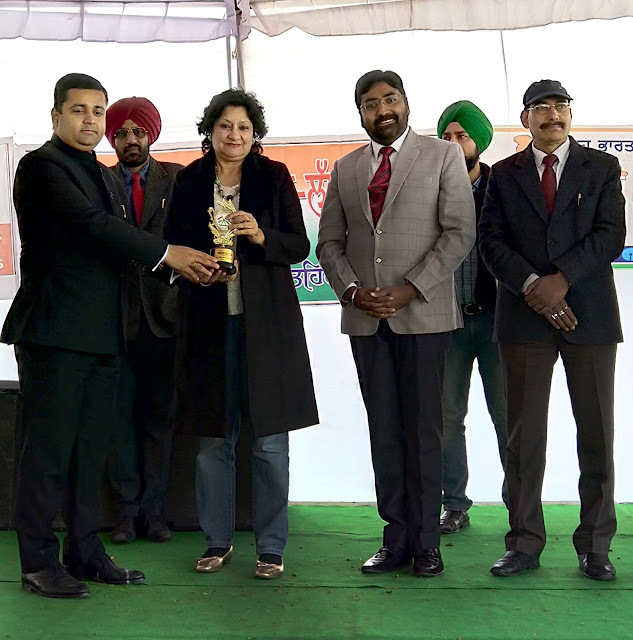 On the occasion of Republic Day Desh Bhagat University Pro Chancellor Dr. Tejinder Kaur honored by SDM Amloh Mr Anand Sagar Sharma for her contribution in the development of state as well India in the field of education. Punjab Government appreciated the efforts made by her to develop an excellent educational hub in rural area of Punjab. Desh Bhagat University in best university in Punjab and in top universities in India is running more than 150 courses in different streams like Media, Dental, Law, Engineering, Agriculture, Hotel Management, Nursing, Ayurveda, Education, Commerce, Management, Computer Sciences etc. SDM Amloh Anand Sagar Sharma in his speech congratulates Dr Tejinder Kaur for her great efforts in the field of education and Social welfare. He said that Desh Bhagat Hospital and Desh Bhagat Dental College are jointly arranging free Dental camps at different places from time to time free of cost for the welfare of people of our society. He also appreciated the social welfare movement Hara Punjab Khara Punjab run by Dr. Tejinder Kaur for the social development of the society. University Pro Chancellor Dr. Tejinder Kaur, in her address payed tribute to all freedom fighters of our country and said that we are so lucky that our forefathers have given us a land of peace and happiness where we breath freedom. She also thanks to the SDM Amloh Mr.Anand Sagar Sharma for such a great honor.